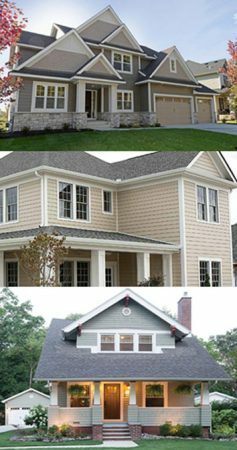 Whether you’re building your home from scratch or remodeling, you can make a big visual impact with your home’s exterior siding and trim color choices. There are classic, tried and true combinations, stone and siding mixes, and some daring color trends in home exteriors. You can use colors to make your home appear larger, blend into a green landscape, or stand out from the rest of the neighborhood! With so many possibilities available for exterior siding colors, it’s helpful to know which classic combinations work well, how to add a splash of color without making your home appear garish, or how to prepare a palette that harmonizes with the natural landscape. 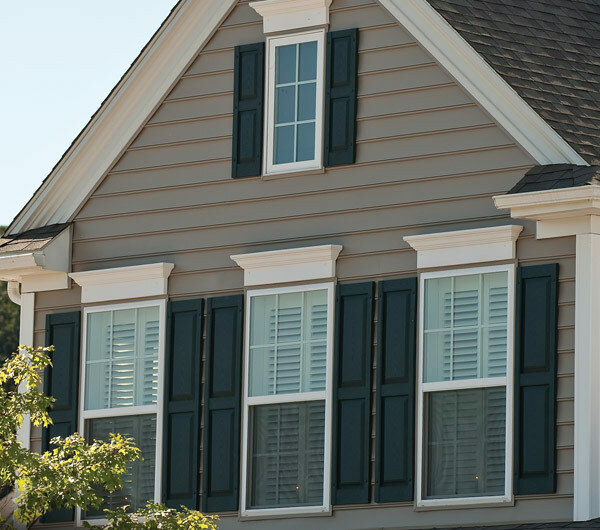 No matter your home style or budget, there’s a perfect exterior siding solution just for your personality and taste. Classic color combinations capitalize on neutrals, greys and beiges with light or white trim, shutters and accents to make a strong visual impact. These more muted colors are ideal for larger homes with dramatic roof pitches and attached garages, since they give the home’s architecture front stage. To add a small splash of color, use bright red or blue front doors or shutters. Tip: Extremely pale yellows and greens also lend a neutral or beige appearance. If your home sits in a lush green landscape, why not emphasize this greenery with your home’s exterior color palette? Greens and blues of a variety of shades are becoming increasingly popular for just this reason. And you can achieve a range of effects using these rich, organic colors. For a more dramatic effect, or to make a small home appear larger, consider dark siding and white trim combos. Of course, pale, sea-foam greens and light sky-blue siding with white trim is also a lovely combination for seaside haciendas. Tip: Use a combination of siding styles and textures in the same color for different areas of the home’s exterior to create pattern and visual interest. 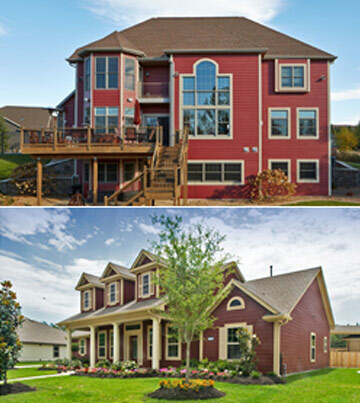 Bold reds, rusts and purples are also a favorite exterior siding combo, especially with Craftsman Style or mixed-material home exteriors. Effective combinations utilize deep rust-colored lap siding and light-cream trim and shutters, or pale purple vertical siding and dark brown trim mixed with stonework and areas of deeo red shingles (we recommend Georgia-Pacific Cedar Spectrum Line) near the roof pitch. Tip: Think of your stonework as a color and a textural element. Balance smooth lengths of vertical siding with rugged stacked stone. Not sure which color combination best matches your home? Try them on for size with this LP Smartside Home Visualizer Tool! 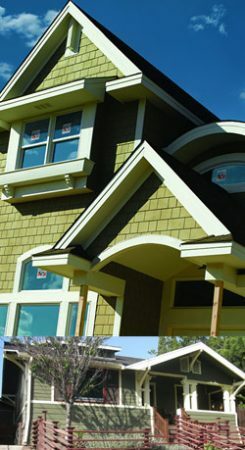 You can even upload an image of your own house to try with a variety of siding styles and color combinations. 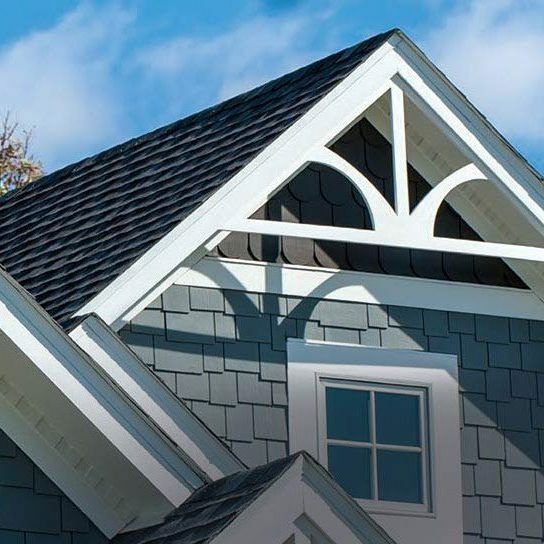 Also, check out our Georgia-Pacific Siding and Palight Trimboard pages to explore colors and styles options. Want to finish the look of your home’s exterior with the perfect front door? Check out our helpful Front Door Installation Guide! Install the PerfectFront Door to Match Your Siding!